Blue Skies and Clouds Manicure - Polish Etc. Today's challenge prompt is inspired by a song. There are a lot of very inspiring songs out there, but how to translate that to my nails? I thought about this one for a while and this is what I came up with. The song I chose was Jason Mraz I Won't Give Up (youtube official video here). I Won't give Up is an extremely beautiful love song, and it's one of my new favorites by Jason Mraz. The song references the sky and stars, and the line that inspired this manicure is part of the chorus: "I won't give up on us, even when the skies get rough" (lyrics © Jason Mraz, Atlantic Records). I started with Deborah Lippmann Let's Hear It For The Boy blue skies on three of my nails, and Maybelline Color Show Impeccable Greys for my grey-sky accent nail. I then added clouds using Sinful Colors Bad Chick (a white nail art polish) and a bit more rain for my "rough skies" accent nail. I was basically flying by the seat of my pants for this manicure. clouds and skies kept coming to mind when I listened to the song so I just went with the inspiration! The clouds were really easy to do! I just did six dots (five for the outline and one for the center). 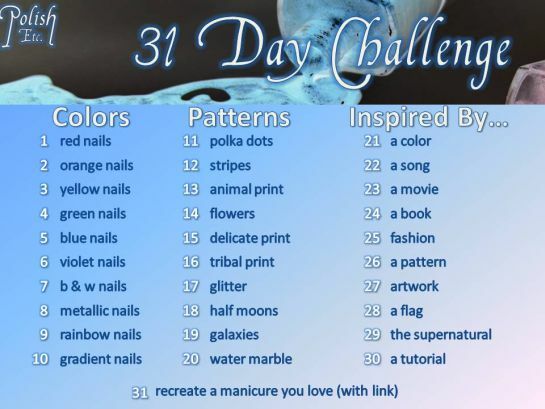 For more info on the nail art challenge click read more!